By Jordyn Grzelewski | June 26, 2018 at 12:05a.m. 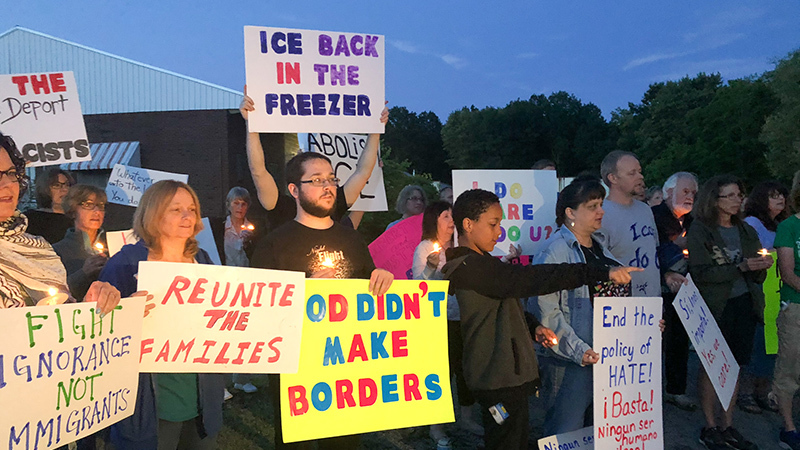 Jordyn Grzelewski | 50 protestors showed up for a candlelight vigil outside a private prison in Youngstown where some immigration and Customs Enforcement detainees are held. Warren Mechling, 8, of Warren had two reasons for speaking in front of about 50 people outside the private prison where some U.S. Immigration and Customs Enforcement detainees are held. “I wanted to share the love of God, and I wanted to share why I don’t want the kids to be taken away from their families,” he said. A peaceful protest and candlelight vigil were convened Monday night by the First Unitarian Universalist Church of Youngstown. The group gathered at 9 p.m. across the street from the Northeast Ohio Correctional Center on Hubbard Road, where some men detained after an ICE raid at the Fresh Mark plant in Salem last week are being held. Participants sang, held candles and protest signs aloft, prayed, recited the Pledge of Allegiance, and shared their views about U.S. immigration policy. That topic has been a national conversation due to the Trump administration’s implementation of a now-rescinded “zero-tolerance” policy that led to adults crossing the border illegally being arrested and their children separated from them. “We know that our religion is based on love,” said the Rev. Dr. Robin Woodberry, director of the Mahoning Valley Association of Churches. She noted the argument that current immigration policies must be followed because they are laws is akin to the Jim Crow laws that enforced racial segregation in America. “These are bad laws, and we need to speak out against them until change happens,” the Rev. Dr. Woodberry said. Representatives of local Jewish and Islamic organizations also participated in the event. Jessica Morris of Boardman spoke about her time in Guatemala, the native country of many asylum seekers coming to the U.S., and about her positive experience with people she met there. “We need to keep fighting,” she said. June 25, 2018 9:31 p.m.
August 29, 2018 12:08 a.m.
September 23, 2017 12:09 a.m.